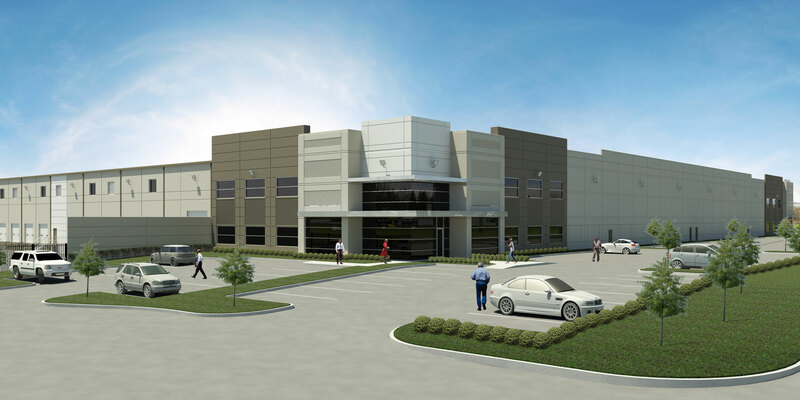 Carson Companies has broken ground on a 365,727 square foot cross-dock warehouse and distribution facility on Houston’s southeast side. Located in Bayport Industrial Park, the building will have easy access to Houston’s Barbour’s Cut and Bayport container terminals as well as the ship channel and petrochemical complex. “This project is a continuation of our strategy to meet the space needs of port and petrochemical related logistics and manufacturing users which have recently been quite active”, said Dan Zoch who leads Carson’s Houston operation. Designed by Seeberger Architecture, the building will feature a 30’ clear height, 50’ x 52’ column spacing, ESFR sprinkler system and 180’ fully secure truck courts. This modern designed cross-dock building is divisible to 45,715 square feet and can accommodate single or multiple tenants. In addition to the practical aspects of this facility, the contemporary design delivers a sleek curb appeal with two story glass and aluminum canopied entrances, an ample parking lot and a fully fenced and secured truck court and trailer storage area. Slate Construction is the general contractor and delivery is scheduled for November 2015.